That expression is somtimes used to announce that a flying saucer has landed. Emotions like horror and fear come to mind, especially when you get a peek at what lurks inside. The same thing happens at this time every year in Austin. It’s not a pretty sight! Here is a map that shows some of the astonishing appraisal increases, as high as 29% in some neighborhoods. Click the graphic to enlarge it. By reviewing the values across the City on TCAD’s website, you will see many $60,000 to $90,000+ increases for single family homes. Many of these same homeowners saw appraisal increases last year that were well above 10%. So, guess what that means. Even though there is a 10% cap on the home value used to calculate their tax bill, the assessment amount above the cap sits in the system to haunt the taxpayer in future years. 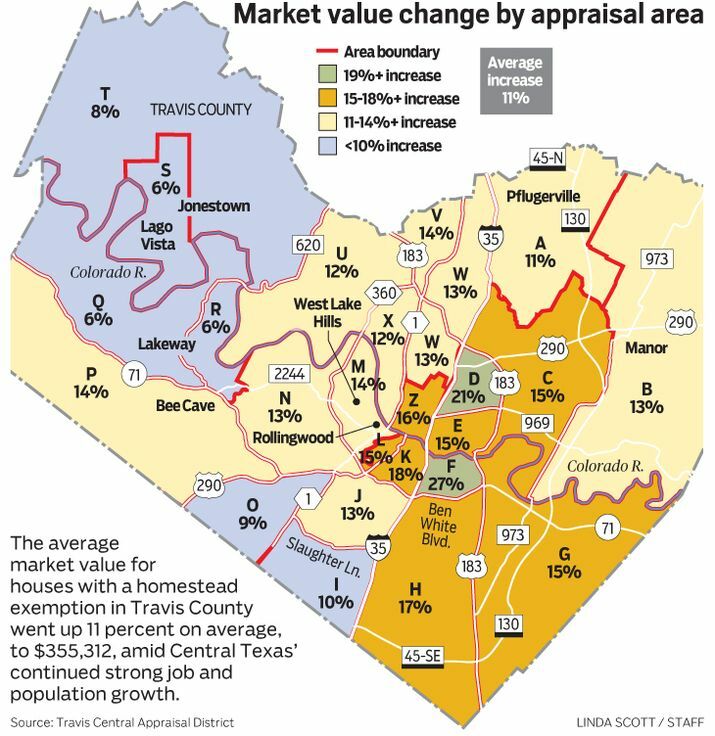 Think about the longtime Austinites who have already seen their tax appraisals double and even triple in the last 10 or 15 years. Then think about the future. If taxes go up just 5% each year, it would only take 14 and a half years for today’s tax bills to double! That’s becuase the impact is compunded. Ask yourself if the City of Austin can sustain that kind of tax spiral. Then you might want another cup of coffee. This entry was posted in General Affordability Updates and tagged Austin, Austin affordability, Austin Property Taxes, Austin tax appraisals, Austin Taxes on April 29, 2015 by Bill Oakey. My home appraisal for 2015 rose by over $100,000! And $70,000 the year before! There is another time bomb in property taxes. The planners at CAMPO (Capital Area Metropolitan Planning Organization) believe that our area can build two personal transport systems. The $35 billion 2040 Plan includes a cadillac road network and a cadillac transit network. (The money is split 50/50 even though the planners’ own calculations show that the transit system will only be carrying 1.6 % of person trips in 2040!) Each of those CapMetro trains will need ~$500 million of property tax bonds. The City of Austin ( and other jurisdictions like Leander etc) also intend to capture more property tax revenue by creating Tax Inctrement Financing Districts around selected train stations with the proceeds going to Cap Metro. This doesn’t raise taxes per se but the diversion of tax revenue from the CoA means that public safety and general welfare programs will have to be cut, or the property tax rate increased. Lone Star Rail intends to create Property Tax Increment Districts around its train stations. This included high dollar property like downtown Austin and the Domain, with the same effect, and they would be getting a cut of not just the CoA property taxes, but also Travis County and ACC property taxes. (The ACC tax increase that was voted down in November was intended to cover its contribution.) The CoA voted on 12-12-15 to create the districts. Lone Star is also interested in doing Sales Tax Increment Districts. There are numerous other taxes that will have to be raised or new taxes created. For instance, Donna Howard has a bill in the lege now that would create a new local tax on car owners that would generate ~$10 million per year of new taxes for trains. CAMPO’s calculation of the costs for the transit system leaves out some major items. The CoA spent ~$100 million on (sales tax) rebates for the Domain development. There will be 30 more train station developers with their own demands for subsidies. The CAMPO Plan calls for conversion of road lanes to bus-only lanes on major arteries like N Lamar, S Congess and Riverside. Lincoln said, “You don’t build one man’s house by tearing down another man’s house.” The conversion value would be incalculable, but certainly in the billions. Building train lines is also relliant on diversion of gas tax revenues away from roads and into transit. TxDOT fought this for years and backed down when TxDOT was given its own source of finance; tolls. With its new blood, TxDOT is able to build cadillac roads, with twice as many lanes as are needed, and expensive flyovers. In a few years we will be payin $100’s of millions in tolls per year. Twenty-two percent of that money will be wasted on toll collection costs! Transit is necessay in megalopolises like New York. It is unecessary in sun belt cities like Austin. Transit usage in Austin peaked in 2,000 (according to the federal database) and is DOWN about 10% since then. In a city that has grown 30% since 2,000, that is an adjusted DECLINE of 40%. Today, less than 1% of weekday trips in the region are by transit. CAMPO projects that to be 1.6% in 2040. Is that worth $17 billion? Plus all of the unaccounted hidden billions? There are private companies that want to build mass transit systems in Austin with there own money. ( AustinPRT.com ) Unlike CapMetro and Lne Star, they will build fully grade separated tracks. They expect to earn a profit and charge lower fares than CapMetro and Lone Star because they beleive that they can grab a much larger share of commuters than the public agencies. Isn’t that CAMPO’s main goal? Reduce vehicle miles traveled on our roads? Travel by personal auto is environmentally cleaner than than public transit in Austin. (But not in New York.) Federal legislation compels auto manufactureers to continue reducing emission each year. The train systems proposed for Austin rely on “big iron” trains that have little expectation of emmission reductions. They lock us into a future of stagnant air quality. Every cost of auto ownership is expected to decline. As computerization increase they become safer and insurance costs will go down. Fuel costs will go down as fuel efficency improves. (Volkswage has a 120 mpg car for sale in Europe. See Volkswagen_1-litre_car at Wiki.) A $6,800 car that gets 85 mpg will soon be sold in the US. ( ElioMotors.com ) It is estimated that our current road system will be able to handle 43% more vehicles when cars are self driving. Transportation is the number 1 assualt on Austin Affordablility. Changes need to be made soon. We need pay-as-you-go roads (with a small bump in the gas tax and a larger bump in the diesel tax.) And we need to let the private sector provide transit. New York spends massive sums on transit, like the $17 billion, 8 mile Second Ave subway under construction now, but there are 1,000 private bus companies in NYC that operate like Uber. They charge the same or lower fares than MTA and get people where they are going quicker, while making a profit. Can we legalize this in Austin? It’s all academic. The next reccession in Austin will solve congestion. Permanently.